Rathhview Mental Health facility in Omagh is part of a complex ecology of social and political events that two decades after the Good Friday peace agreement are still being untangled. During the troubles, the ordinary anxieties of everyday life were delegated to the ongoing violence. But as decades of daily turmoil receded a void appeared. Anxieties remained but with nowhere to go they manifested in an epidemic of serious mental health problems. Since the Good Friday agreement, more people have died from suicide in Northern Ireland than were killed during the troubles, leaving the province with the highest suicide rate in the UK. This is, therefore, an important building. 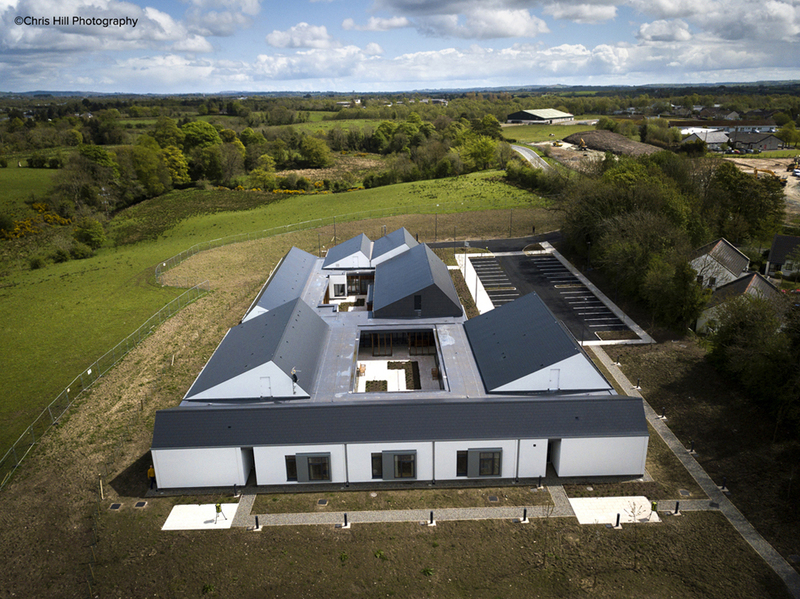 Situated a rural greenfield site on the outskirts of Omagh, the new £2.8 million, 1169m² facility contains a twelve-bed Discharge Unit and a six-bed Recovery Unit, that will increase the range of community-based mental health services, helping those with complex mental health problems on their path to recovery and independence. The medium-stay Discharge Unit focuses on rebuilding residents’ confidence and independence by providing a domestic environment, with autonomous access to their accommodation. The six-bed Recovery Unit offers short-term care for clients, and the en-suite rooms are specifically designed to balance resident privacy with essential observation and access. Sensitively arranged around a fully enclosed courtyard, the unit includes staff accommodation and communal areas, including a social living room, a TV room, treatment rooms and an ADL room. The plan — twelve individual, one-person apartments, two social spaces and a kitchen — orientated around two internal timber and render clad courtyards means that the building enjoys a good amount of natural light. Windows at the end of corridors draw the eye towards the surrounding countryside — much better than a blank wall — and the generous amounts of glazing coupled with the geometry of the building create nice oblique views across the courtyard. The courtyard landscaping is yet to mature but feels a little sparse and pragmatic — a missed opportunity to soften what materially feels like a hard building. Although bright and airy the corridors have to wrestle against the architect specified, pastel yellow and blue walls and grey vinyl floors, to make the space feel a little less clinical and institutional — perhaps once the building is occupied this will change — but at the moment I’m not sure it quite achieves the feeling of being a home-from-home; an important concept in the design of mental health facilities. Despite the changes in colour and being anchored around the focal point of a central courtyard, the lack of differentiation between the predominantly white corridors left me feeling slightly disoriented. Views from the accommodation into the courtyard and surrounding countryside can be enjoyed from window-seats set into deep reveals. From here, the gaze is drawn through pine composite windows and Iroko clad external columns towards panels of stained western red cedar cladding and render — my preference would have been for an unstained cedar that would age more gracefully and require less maintenance. The composition of these forms works well but is overcomplicated by the use of four different types of timber — a simplicity present in the early design, visualisations of the scheme seems to have been lost. Also, I suspect that the rain, being a much better architectural critic than me, will, over time, have something to say about the north-facing, white painted render walls. The vast amounts of natural light; windows at the end of corridors and courtyard views are the buildings redeeming features. As always I ask the architects what, with the benefit of hindsight, they would do differently: the orientation of the building was one answer — the first thing one sees is the refuse area, and on a site with few obvious constraints this could maybe have been located elsewhere. The architects also felt that they could have achieved greater efficiency of space, however, I found that the plan was well considered and efficient. Detailing of the bay windows — which is a little heavy — and reconsidering the amount of render were also part of the healthy process of post-rationalisation. Rathview follows the precedent for quality healthcare design set by Richard Murphy Architects 2009 award-winning mental health facility in Stratheden. Although Murphy's scheme is more successful by virtue of a more nuanced use of its material pallet. That being said, like Murphy's scheme, this is a well-intentioned building that avoids the artificially lit, clinical, 'double-loaded' corridors typical in many healthcare buildings. Also in line with current research by the Centre for Urban Design and Mental Health Rathview connects its users to the surrounding landscape and creates spaces for communal interaction — all important elements of the healing process. However both schemes could have benefited from the use of warmer more ‘homely' materials (see Dandenong hospital mental health facility in Melbourne by Bates Smart) — at some point, our obsession with white render has to give way to allow the creative exploration of other fenestration options. In Northern Ireland, one in five adults has a mental health condition at any one time. Compared to England that's a 25% higher overall prevalence of mental illness. However, earlier this year it was widely reported in the media that the lack of a functioning executive is creating financial difficulty for a service that is already under significant pressure. While more money certainly doesn't always equate to better architecture what Todd's have achieved — for what in my opinion is a meager 2.5 million pound budget — is a good conversation starter about what design for mental health care in Northern Ireland could achieve.